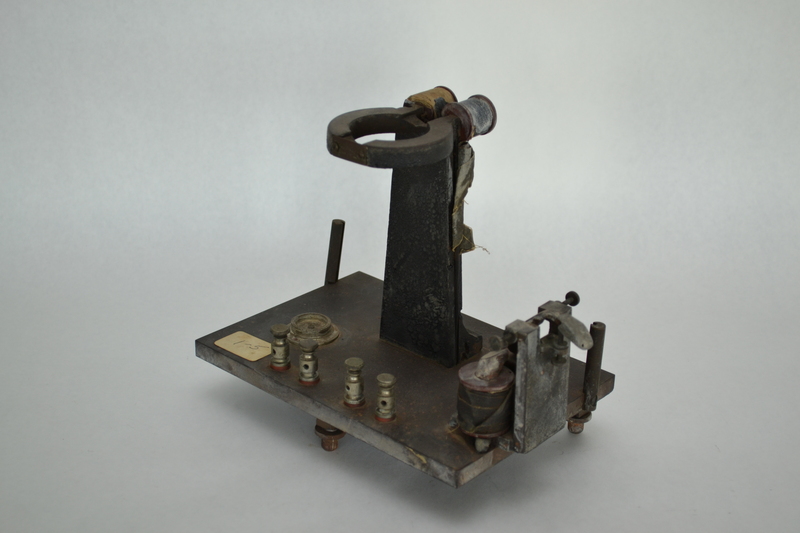 Name that apparatus: A call for historical detectives! Yesterday, I explained all about my internship project identifying and cataloguing apparatuses. Today I want to enlist your help in identifying eleven items that remain unidentified in the new database. Historians, loyal CHP fans, summon your inner detective and help solve the mysteries of these ten items that have defeated me! You will win unending CHP glory: that is to say, if you make a successful identification and there’s an interesting back story then I’ll publish it in future blog posts. Wild speculation is also encouraged for its entertainment value! Comment away! 1. 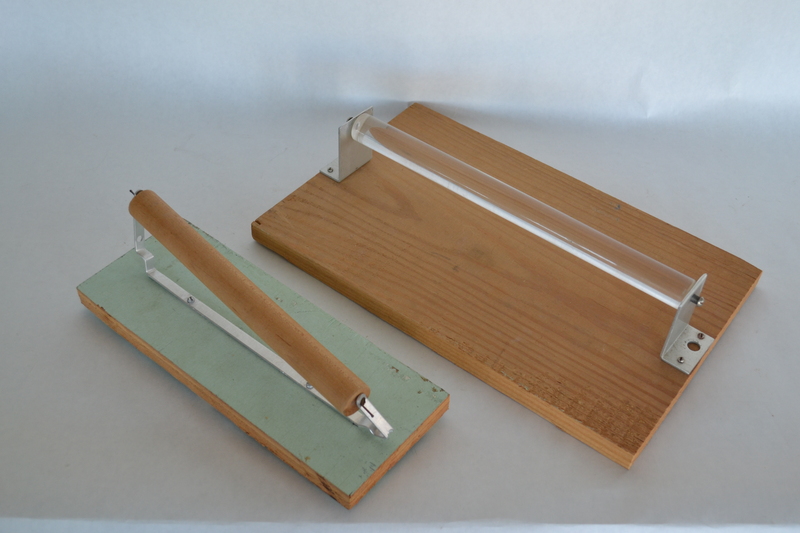 Rolling dowel mounted on wood stand, one large, one small. Accompanied by clear plastic sheet and electric plug. Appears homemade. 2. Two wooden apparatuses. 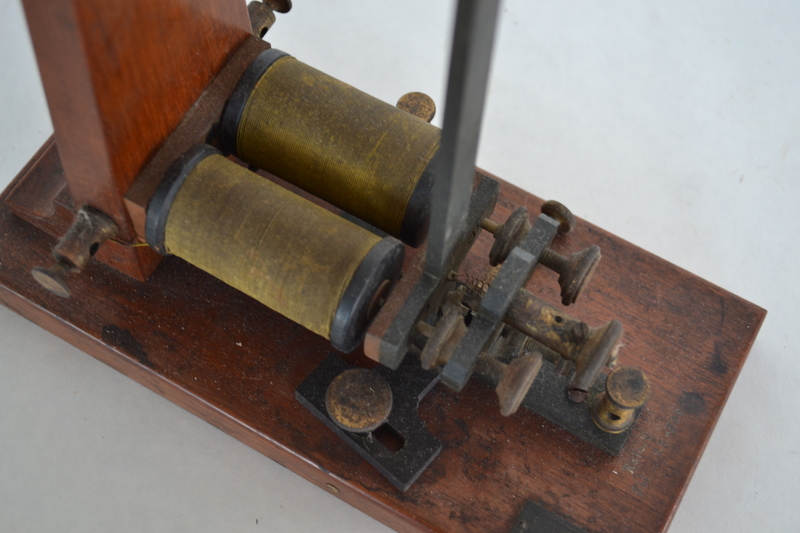 Largest apparatus has movable knobs on either end and a set of telegraph like keys in the center. Second wooden device is square and numbered in a square, increasing from one on the outside corner to 100 on near the center. 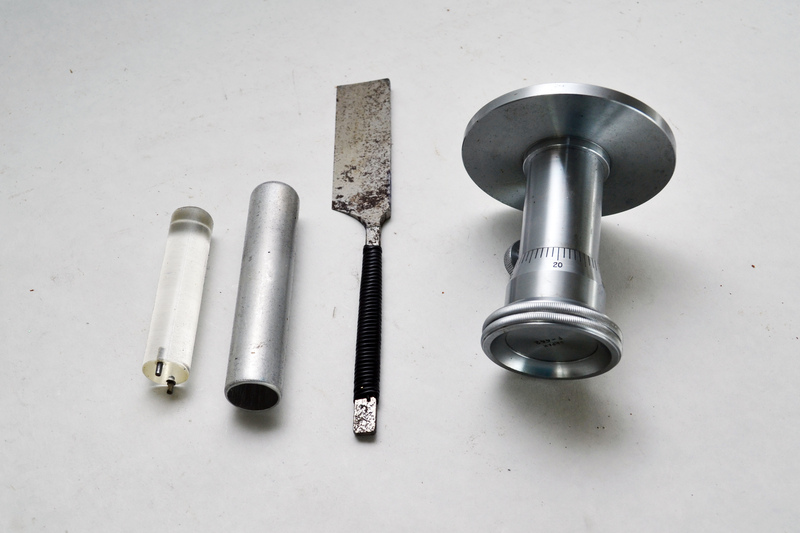 Has pins and adjustable metal pegs that have the remnants of thin wire. 3. 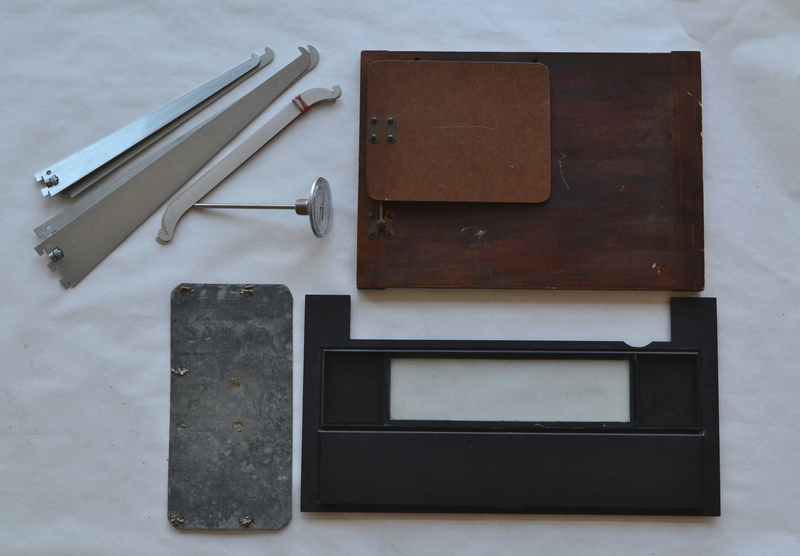 Sheet of wood with adjustable screen (similar to the kind used for mirror drawing), instrument showing temperature, made by H. D. Trarice Co., what appears to be metal shelf holders, a welded sheet of metal, and a plastic cover with a clear plastic window and a hinged opening. 4. 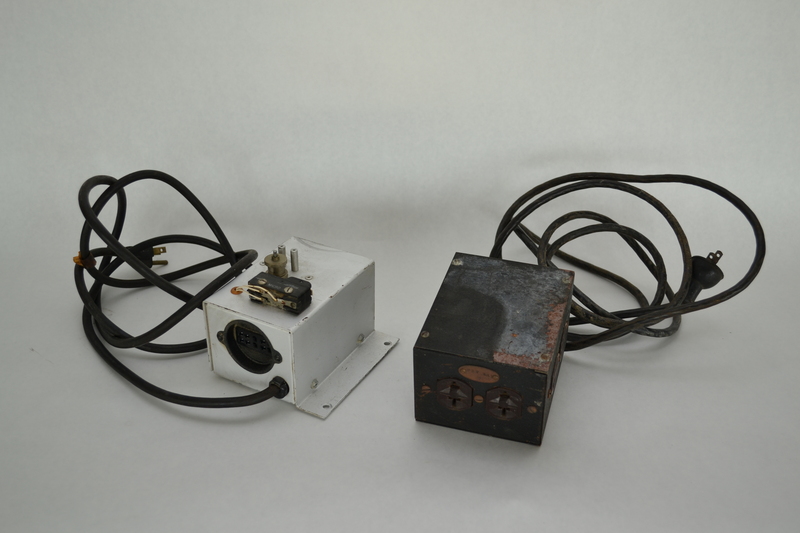 Box shaped apparatus with open sides and an electrical plug. Made by Lafayette Instrument Company. 5. 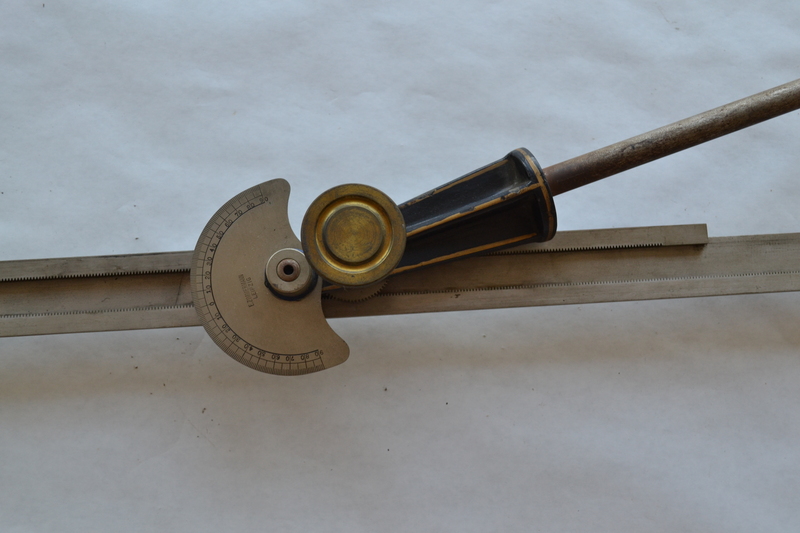 Long metal instrument with rotating part and half circle angle markings and measurement markings on the back of the long piece. Made by E. Zimmerman, Leipzig, Model #86070. 6. Grey electrical switch and power supply. 7. Heavy black apparatus with a central stand with a hole at the top. 8. Greenish metal box with electronics inside it. Made by Orrteronics Inc.
9. 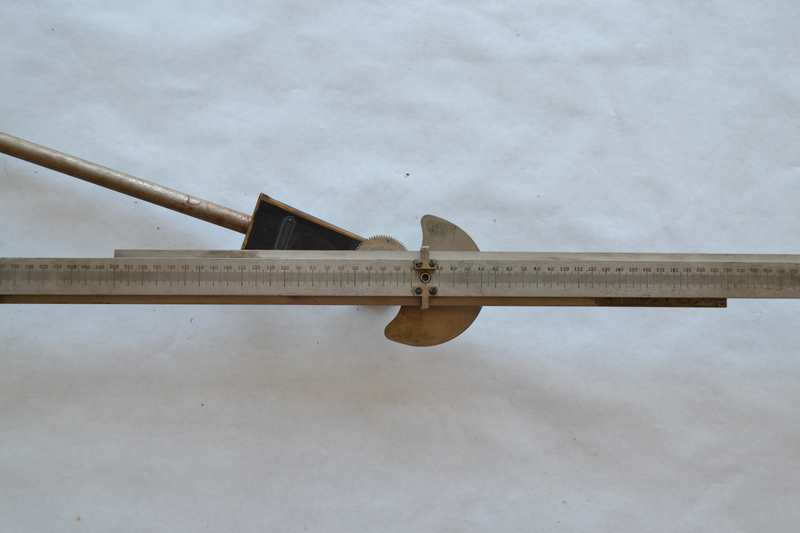 Metal instrument. Made by Lafayette, Japan. 10. 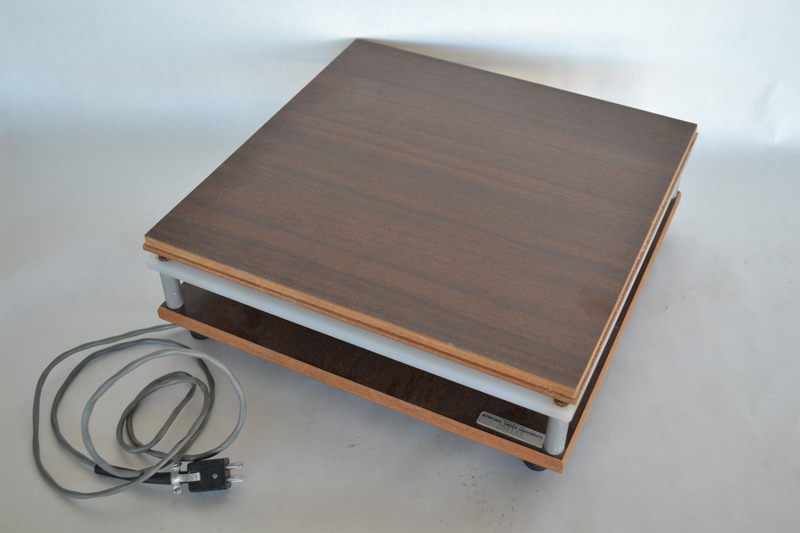 An electrical apparatus mounted on a wooden stand. 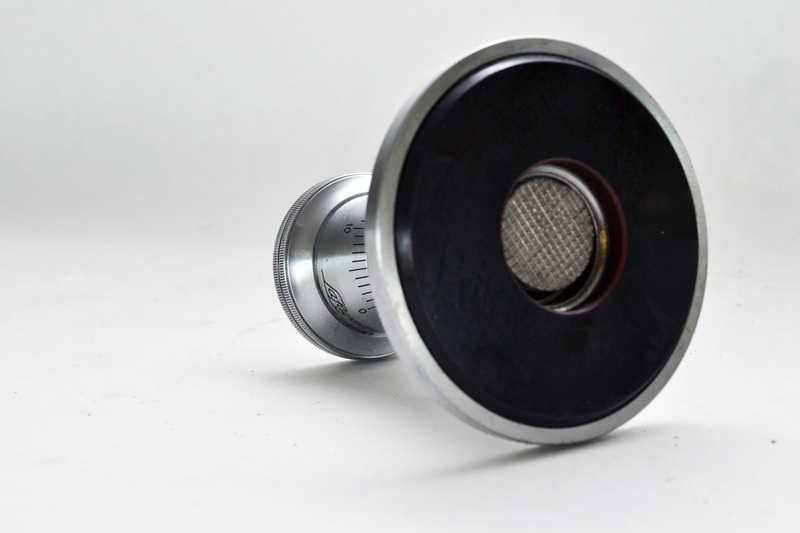 Made by Spindler & Mover. 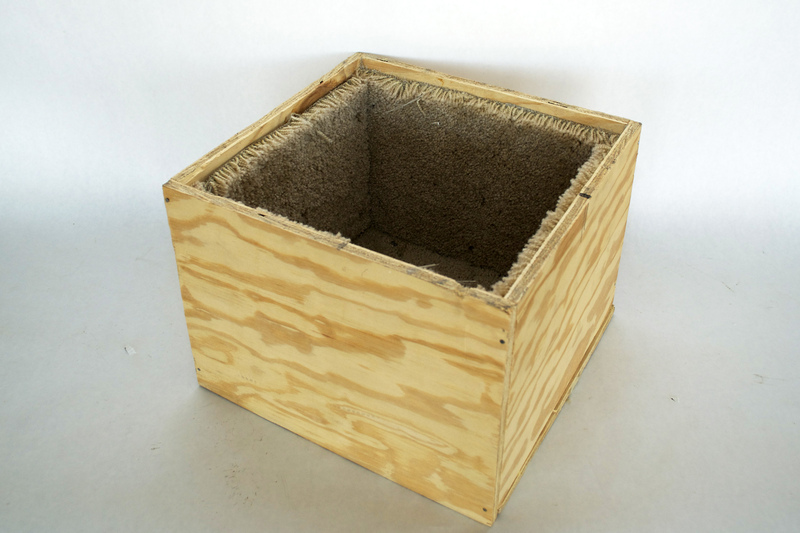 P. S. I promised I’d finish the story about the mystery carpeted box. 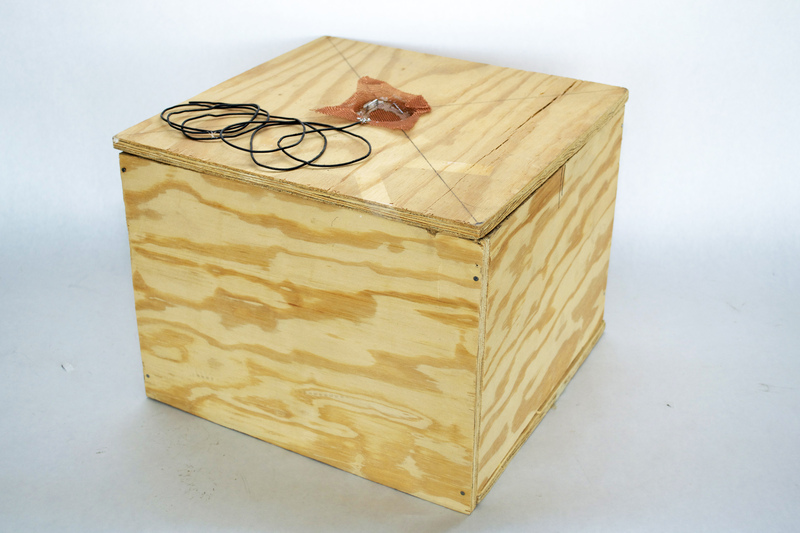 Turns out it’s a soundproof box used with duckling hearing experiments, donated by Gilbert and Nora Gottlieb. How did I find out? Well, on the shelf next to the mystery box there was a mostly empty wooden crate that had clearly been used to ship something to the archive. The return label listed the Gottliebs and in the bottom of the crate was a 1994 article ‘Influence of Auditory Experience on the Development of Brain Stem Auditory-Evoked Potential in Mallard Duck Embryos and Hatchlings’, published in Behavioral and Neural Biology by Lubov P. Dmitrea and Gilbert Gottlieb. 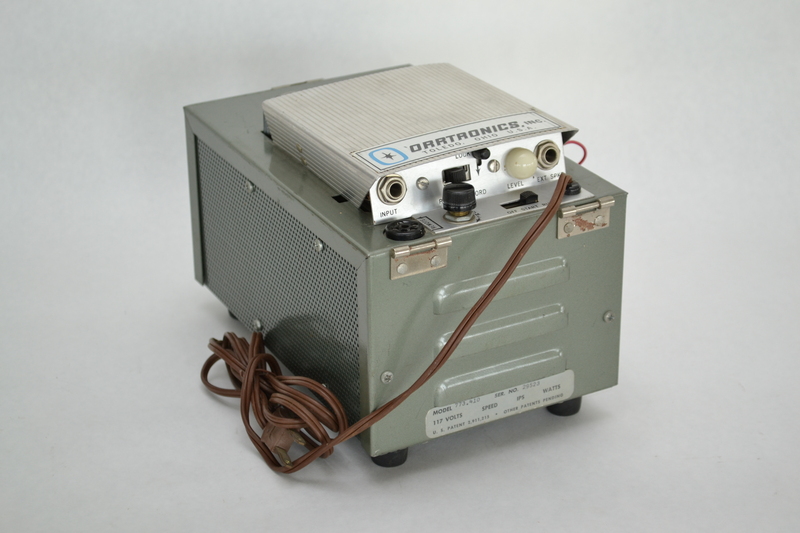 There was only one apparatus donated by the Gottliebs listed in the old database: a timer used for duck imprinting experiments. I decided, based on this, that the box must have been used to ship the timer, but that the timer had been misplaced in the move. But when Cathy Faye took a look, she suggested that the two items on the shelf might be connected, the crate used to ship the mystery box instead. Of course! 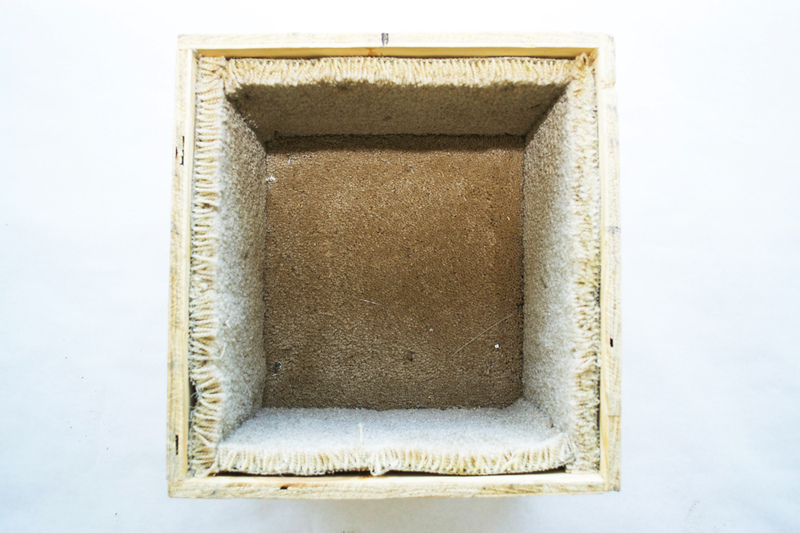 A closer look at the article in the crate confirmed the box’s identity—“a sound attenuated box” in which “Acoustical stimuli” (tone pips at 500 and 750 Hz) were played through a loudspeaker 10-12 cm above the ducklings’ heads. Volia! Mystery solved! 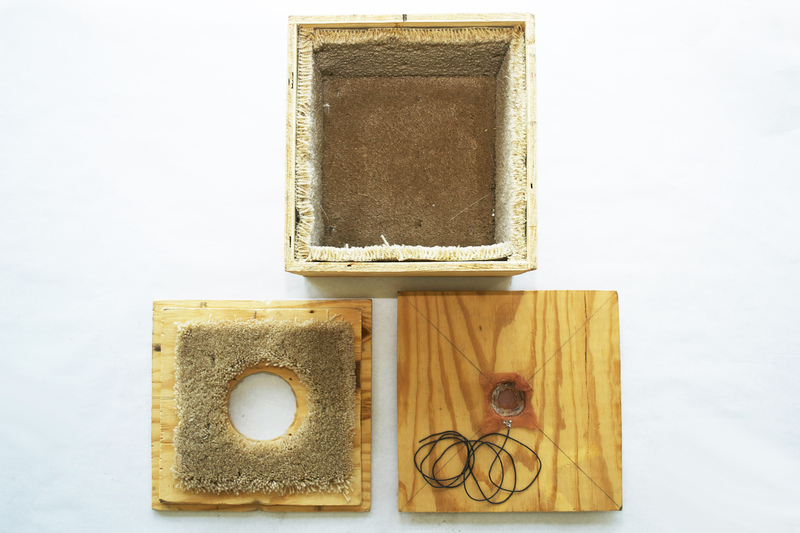 An interesting story reattached to an otherwise mystifying carpeted box! The CHP has yet another York University intern on board! Elissa Rodkey, a doctoral student in York University’s History & Theory of Psychology program, shares her experience doing some detective work in the CHP Artifacts Collection! 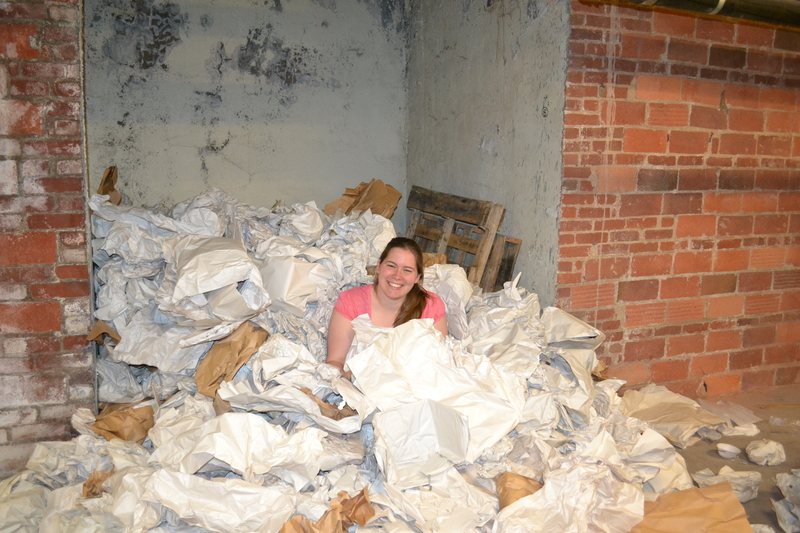 In a corner of the otherwise tidy basement of the Center for the History of Psychology, there is a large pile of crumpled paper. As intern at the CHP, I am solely responsible for the creation and steady growth of this pile. Yet despite its messy appearance it is a sign of better order coming to the basement. The ever-growing pile of packing paper. 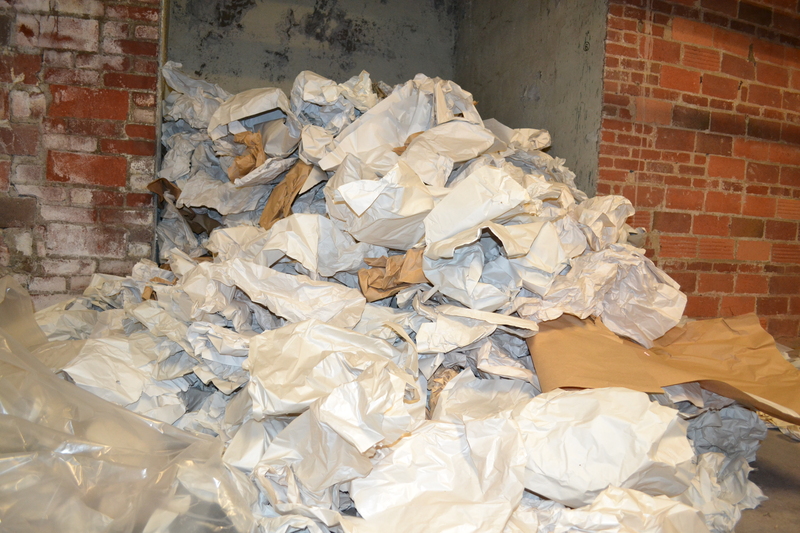 The paper is the result of processing apparatuses—it is the packing paper used in the boxes of the more than 200 instruments, apparatuses, and other artifacts that I have processed thus far. In 2010 the CHP moved locations and the psychological apparatuses that had previously been sitting open on shelves were packed up in boxes and deposited in the new building’s basement. But with the move went the organizational scheme—although the boxes were very carefully labeled with their original shelf location, these bore no relationship to their new shelf locations, making locating any given apparatus difficult. If a CHP staff member needed to find a particular apparatus, the best they could do was to wander through the shelves and look at the snapshots taped to the outside of the box. Since some of the boxes are stored 3 deep, this system was clearly less than ideal. So my job while interning at CHP is to make this collection usable again: to match the apparatus with its data from the old database, and import it into the new database along with some pretty new photos, since the new database has the added benefit of allowing for the online display of collections. (You can admire the part of the apparatus collection I’ve entered here). This is harder than it sounds. It’s not uncommon for me to find an apparatus with absolutely no identifying information to go on. 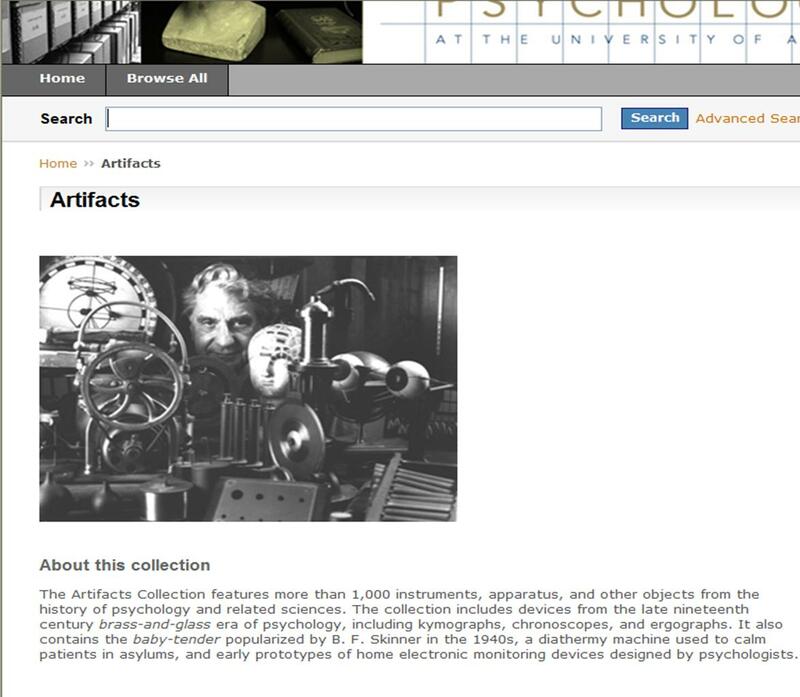 That’s where my history of psychology background helps—I consult old apparatus catalogues and try a couple Google searches based on my hunches about what the apparatus might have been used for. But sometimes I’m just stumped. 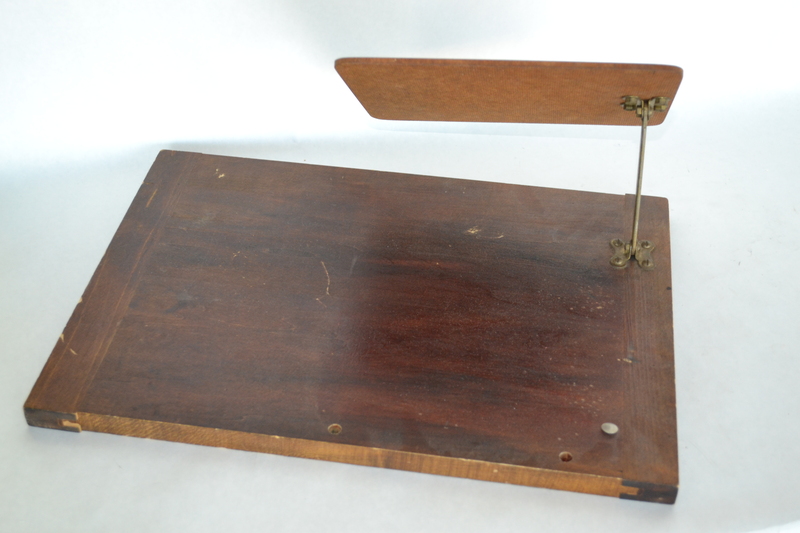 Any ideas about what this apparatus was actually used for? This box is actually one of my success stories—thanks to outside help I did eventually identify it! 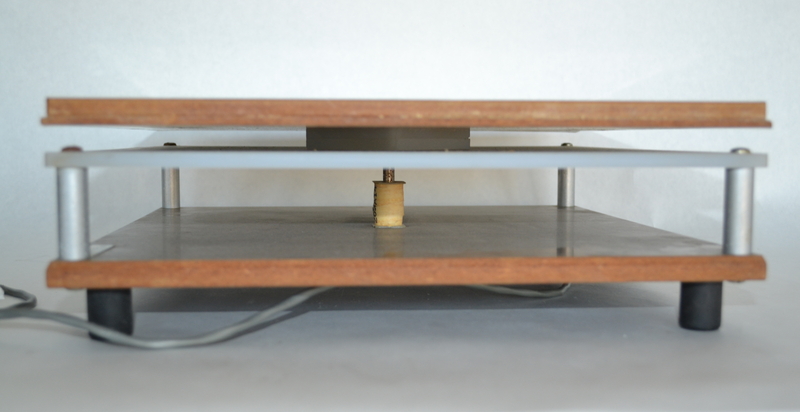 I’ll reveal the apparatus’ identity in tomorrow’s post; meanwhile you can post your best guess in the comments. Tomorrow I’ll also enlist your help in identifying ten items that still have me stumped, so do check back! 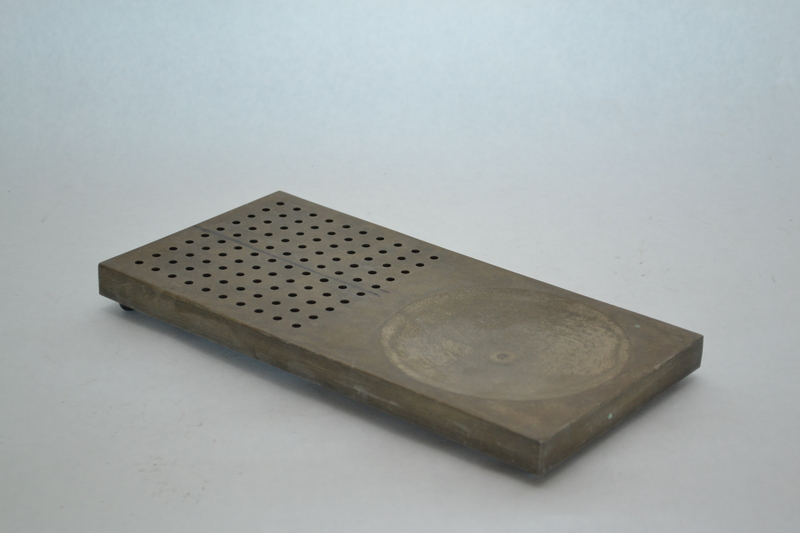 Be sure to check back tomorrow to learn more about the mystery object! You can browse the CHP Artifacts Collection online. The CHP is happy to welcome Arlie Belliveau back for a month-long practicum! Last summer, Arlie came on board as a temporary intern, helping to digitize and organize parts of the CHP Moving Image Collection. Sitting in the basement at the Center for the History of Psychology, I quietly watch the 1960s child development films of Stanford University neonatal psychologist Dr. Anneliese Korner. The projector is running smoothly today, and I’ve found a good setup for the digital camera. Sitting silently on its tripod, the camera captures the clicking projector but more importantly the images of the children on the screen. I wind the film onto an archival core and seal it away in the stacks. It is my job to record an access copy that will be available to future researchers and to create robust metadata that patrons will be able to access online. This is the task ahead of me as I sit and watch the tiny infants on the screen. The research films I am working with this spring document the first few hours of the lives of 32 full-term infants. Made as observational aids for Dr. Korner and her collaborators (Bernadine Chuck, Soula Dontchos, and later Dr. Evelyn Thoman), they were used to corroborate notes taken on the innate behavior of infants, before they’d had a chance to learn actions or responses from their mothers. The child currently projected upon the screen is crying. Soon it will be sleeping, or thumb-sucking, or kicking and crying again. 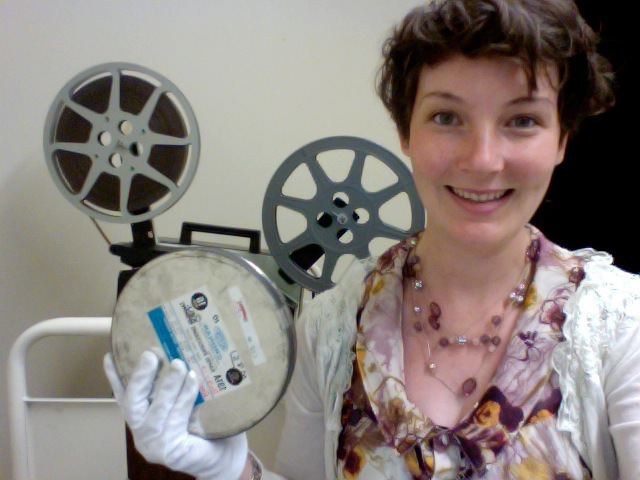 There are 69 of these 16mm polyester films for me to go through during my month-long research practicum. I look forward to blogging about the experience as it unfolds. Arlie R. Belliveau is a doctoral student in York University’s History & Theory of Psychology program. She studies the earliest uses of motion picture film technology by psychologists in their research. You can read about Arlie’s previous adventures in the CHP film collection here, here, and here. Ever wish you could search all of the CHP collections at once? Wish you had better remote access to our collections? Now you do! We’re happy to announce the launch of CHP Digital Collections, a new repository for descriptive metadata and digital objects from the CHP holdings. The goal of this new project is to allow you to search all of our collections and materials from the comfort of your own computer or smartphone. This searchable, online repository will eventually allow users to access descriptive data for all of the items in our collections. 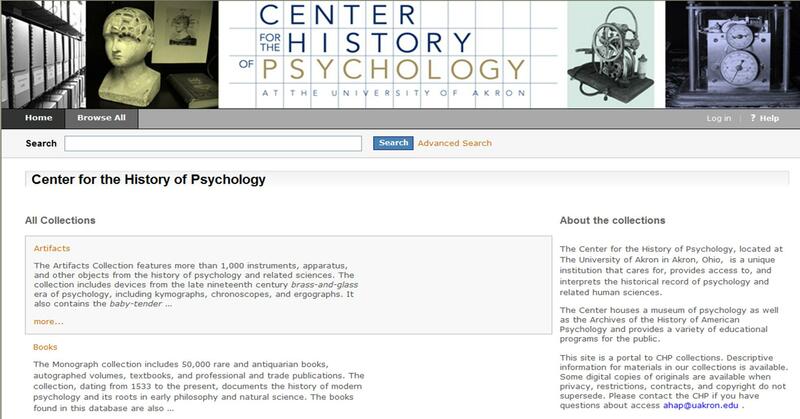 The repository also provides open access to many digitized copies of our paper-based materials, including books, grey literature, and psychological tests. 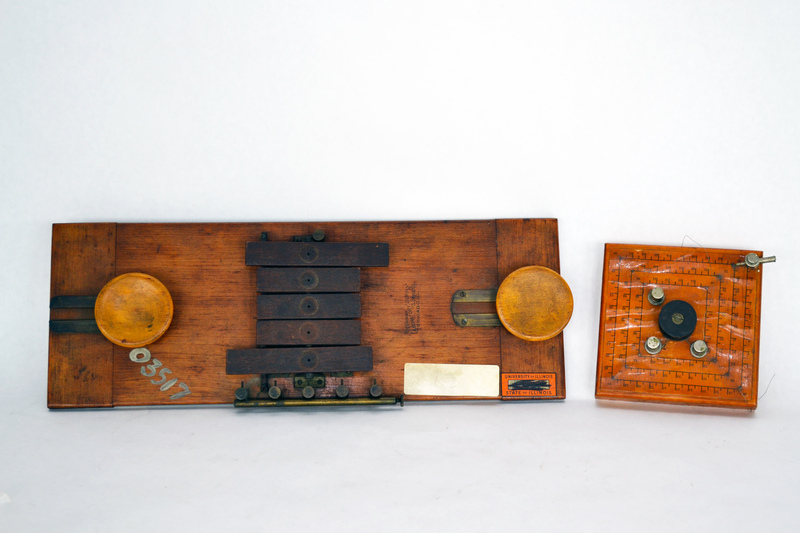 Interested in seeing what we have in our Artifacts Collection? 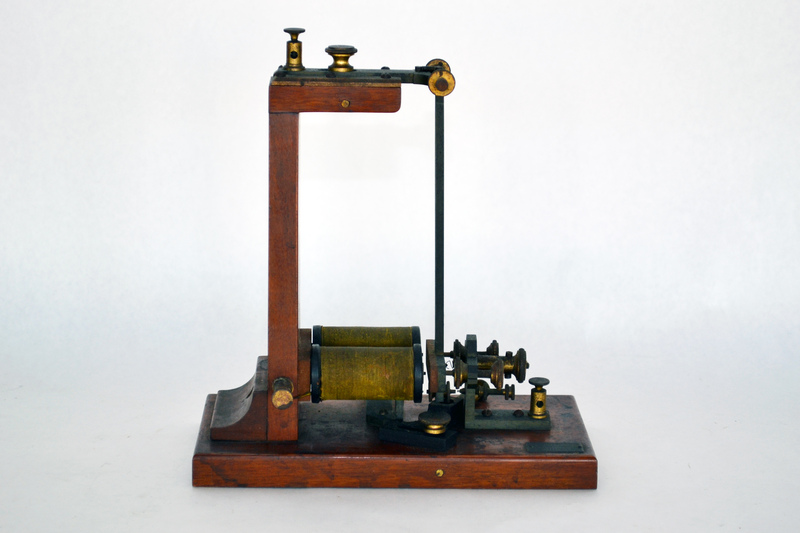 Users can zoom in on photographs and read descriptions of the instruments, apparatus, and other objects in that collection. The digital repository also provides a link to all of the available finding aids for the CHP Manuscript Collection. To date, there are just over 33,000 records available in this system with about 7,000 images and PDFs available for viewing. Three collections contain lists of complete holdings: Books, Manuscripts, and Tests. Three collections are still works in progress: Artifacts, Moving Images, and Special Interest. Still to come: Sounds Recordings and Still Images. Other academic units across The University of Akron campus have been invited to post their collections, including the Jim and Vanita Oelschlager Native American Ethnographic Collection that is currently on display in CHP galleries. Head over to CHP Digital Collections today to browse or search our holdings! We continue to add new items daily, so check back often. If the search results indicate that the file is restricted, simply contact us at ahap@uakron.edu to request access. Stay tuned here on the blog for future tips of searching and using this new tool! The CHP Welcomes a New Staff Member! 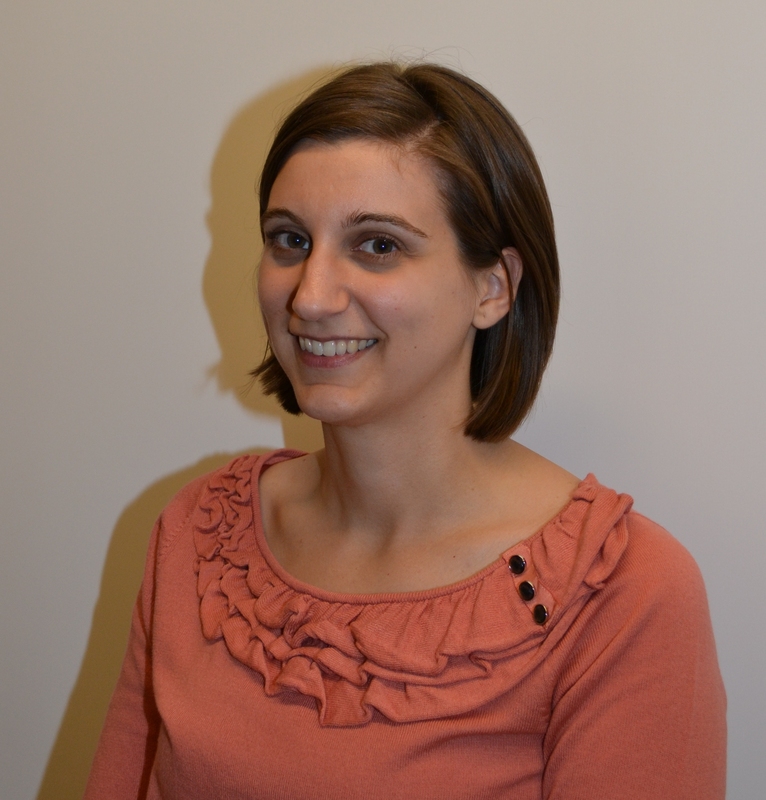 On May 1, Emily Gainer joined the CHP as the Special Collections Librarian/Assistant Processing Archivist. We’re very glad to have Emily as part of the CHP and we’re happy to introduce her to our patrons! I am thrilled to be a new member of the CHP staff. As I said in my interview, “I love archives”! At the CHP, I will organize and preserve archival collections and create descriptive finding aids to help researchers locate materials. I will also catalog books and other materials. My main interest in archival work is providing access to collections. I believe archival material is collected and preserved to be used, not to sit in a storage room. I have worked in the archival field for 12 years. Before coming to CHP, I worked in Archival Services at The University of Akron for over three years. I also worked at Oberlin College Archives and Youngstown State University Archives & Special Collections. I have a Master of Library and Information Science degree and a Master of Arts degree in public history from Kent State University, as well as an undergraduate degree from Heidelberg University. I live in Akron with my husband, Jay, and a two-year-old dachshund named Duke.